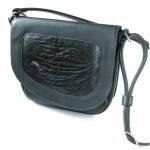 Black leather flap-closure purse with ostrich leather insert, turquoise leather accents. Front open pocket, leather lining, interior zippered pocket. Stainless steel hardware. The main compartment is about 8" wide, 7" tall, and 1 1/2" deep. It is large enough to hold a checkbook wallet, Kindle Fire, an average size e-reader, or most smart phones. This purse, along with its fellows, started with a single rectangle of wet-felted fabric I made in a class taught by avid felter Jean Titibach in Prairie du Chien, Wisconsin, in February, 2015. I admired the fabric as it lay on my work table for a few weeks, but it needed to be more than just a "pretty" collecting dust. Even so, I alternately felt reluctant to cut into it and eager to see how it would combine with my leather work. The project morphed into a major purse making project using several different kinds of decorative inserts, from the felted wool to ostrich shin leather to hair-on calfskin.